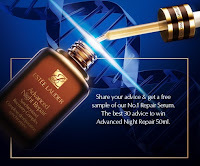 Share your advice and get a free sample of Estee Lauder's No. 1 Repair Serum. And, the best 30 advice to win Advanced Night Repair 50ml. The one formula beautiful skin can't live without. See a dramatic reduction in the visible signs of aging. Inspired by DNA research.